Please distinguish between this Steven Erikson (1959-____), author of Gardens of the Moon, and Steve Erickson (1950-____), author of Days Between Stations. Thank you. Steven Erikson is quite well known for his dark and epic Malazan Books of the Fallen, a series that we of MG have loved for more of a decade. It may be hard to believe, but this author has a lighter side ... and a great love of the cheesy goodness that is the original Star Trek. Steven has wanted to write a work along these lines for some time, and encouraged by his wife, he finally has. The result is Willful Child, a star trekking farce beyond compare, chronicling the voyages of the starship A.S.F. Willful Child. (See Patrick’s review here.) Join us as we celebrate Steven’s affectionate and hilarious homage to Gene Roddenberry’s creation. Steven Erikson signs Willful Child in San Diego. Steven Erikson signs The Crippled God. Steven Erikson discusses The Crippled God. 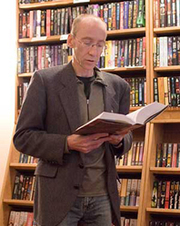 Steven Erikson reads from Toll the Hounds. Steven Erikson reads from and signs Toll the Hounds, Book 8 in the Malazan series. Information from the Slovak Common Knowledge. Edit to localize it to your language. Steven Erikson se ve skutečnosti jmenuje Steve Rune Lundin. Pseudonym si zvolil podle rodného jména své matky, milovnice dobrodružných románů. Narodil se v kanadském Torontu v roce 1959. Vystudoval paleontologii a 18 let jezdil po vykopávkách v Jižní a Střední Americe. Tak poznal i svou ženu. Spolu se přestěhovali do Anglie, kde však nemohl najít odpovídající místo, takže byl nucen vykonávat různé kancelářské práce. S těmi mohl praštit až ve chvíli, kdy jeho Měsíční zahrady sklidily obrovský úspěch. Autorova popularita má i svou příjemnou stranu – patří k nejlépe placeným autorům tohoto žánru. Nyní se věnuje pouze psaní, jeho cyklus Malazská Kniha padlých má už osm dílů (z plánovaných deseti). Napsal i humornou novelu Potoky krve, popisující dobrodružství nekromantů Korbala a Bauchelaina a jejich lokaje. Steven Erikson is currently considered a "single author." If one or more works are by a distinct, homonymous authors, go ahead and split the author. Steven Erikson is composed of 8 names. You can examine and separate out names.